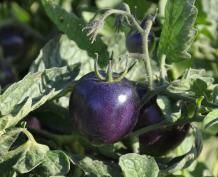 Purple tomato debuts as ‘Indigo Rose’. I will be carrying this tomato this year if it is still available when I order seeds. This is a photo from a customer of mine who grows my plants. 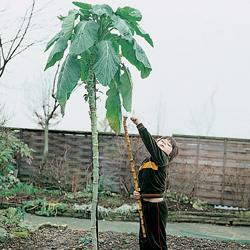 Some of These are 9 feet tall, encroaching on the eaves. This is to whet you appetite for the coming summer. Well, it’s mid January, actually almost the end of January. February will be here before you know it. It seems to early to start planning your garden but this is traditionally the time most of us reach for our seed catalogs which are abundantly filling our mailboxes right now. It is dreary out there and nothing is more satisfying than sitting by the fire with a cup of coffee and thumbing through them, earmarking pages with new veggies and flowers that we want to try. My list is huge and that’s just for my personal garden. My tomato and peppers are a totally different matter.I envision putting less tomato plants in my garden and trying out some heirloom vegetables like Walking Stick Cabbage, which looks like fun and some heirloom sweet peas from Thompson and Morgan. As I look at the birds picking at the apples we left on the tree in the fall (complete with worms for protein) and watch the cats gingerly walk across the snow that covers our garden beds, I am impatient with big plans for my garden this year and have to remind myself that spring will be here soon.